The PGA Championship is the third-oldest of the men's professional golf majors, dating to 1916. Which means it's been played at many different golf courses over the years. Which golf courses? The full list appears on this page. But first, let's consider the PGA Championship golf courses in another way: which courses have been used by the PGA of America most often? 2022 Trump National Bedminster Bedminster Township, N.J.
2021 The Ocean Course Kiawah Island, S.C.
2020 TPC Harding Park San Francisco, Calif.
2019 Bethpage (Black) State Park Farmingdale, N.Y.
2018 Bellerive Country Club St. Louis, Mo. 2017 Quail Hollow Club Charlotte, N.C.
2016 Baltusrol Golf Club Springfield, N.J.
2015 Whistling Straits Kohler, Wisc. 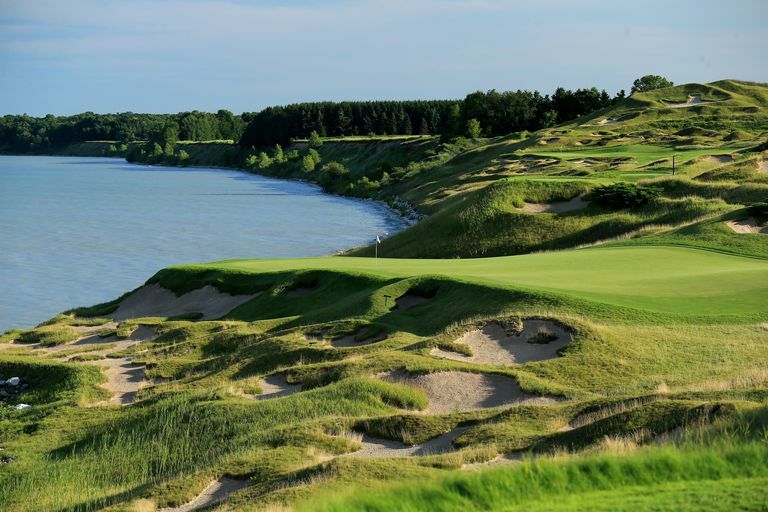 2014 Valhalla Golf Club Louisville, Ky.
2013 Oak Hill Country Club Rochester, N.Y.
2012 The Ocean Course Kiawah Island, S.C.
2011 Atlanta Athletic Club Johns Creek, Ga.
2010 Whistling Straits Kohler, Wisc. 2009 Hazeltine National Golf Club Chaska, Minn.
2008 Oakland Hills Country Club Bloomfield Township, Mich.
2007 Southern Hills Country Club Tulsa, Okla.
2006 Medinah Country Club Medinah, Ill.
2005 Baltustrol Golf Club Springfield, N.J.
2004 Whistling Straits Kohler, Wisc. 2003 Oak Hill Country Club Rochester, N.Y.
2002 Hazeltine National Golf Club Chaska, Minn.
2001 Atlanta Athletic Club Atlanta, Ga.
2000 Valhalla Golf Club Louisville, Ky.
1999 Medinah Country Club Medinah, Ill.
1998 Sahalee Country Club Redmond, Wash.
1997 Winged Foot Golf Club Mamaroneck, N.Y.
1996 Valhalla Golf Club Louisville, Ky.
1995 Riveria Country Club Pacific Palisades, Calif.
1994 Southern Hills Country Club Tulsa, Okla.
1992 Bellerive Country Club St. Louis, Mo. 1991 Crooked Stick Golf Club Carmel, Ind. 1990 Shoal Creek Country Club Birmingham, Ala.
1989 Kemper Lakes Golf Club Hawthorn Woods, Ill.
1988 Oak Tree Golf Club Edmond, Okla.
1987 PGA National Golf Club Palm Beach Gardens, Fla.
1985 Cherry Hills Country Club Denver, Colo.
1984 Shoal Creek Country Club Birmingham, Ala.
1983 Riviera Country Club Pacific Palisades, Calif.
1982 Southern Hills Country Club Tulsa, Okla.
1981 Atlanta Athletic Club Duluth, Ga.
1980 Oak Hill Country Club Rochester, N.Y.
1979 Oakland Hills Country Club Bloomfield Township, Mich.
1978 Oakmont Country Club Oakmont, Pa.
1977 Pebble Beach Golf Links Pebble Beach, Calif.
1976 Congressional Country Club Bethesda, Md. 1974 Tanglewood Golf Club Winston-Salem, N.C.
1972 Oakland Hills Country Club Bloomfield Hills, Mich.
1971 PGA National Golf Club Palm Beach Gardens, Fla.
1970 Southern Hills Country Club Tulsa, Okla.
1967 Columbine Country Club Littleton, Colo.
1965 Laurel Valley Country Club Ligonier, Pa.
1962 Aronomink Golf Club Newtown Square, Pa.
1961 Olympia Fields Country Club Olympia Fields, Ill.
1959 Minneapolis Golf Club St. Louis Park, Minn.
1958 Llanerch Country Club Havertown, Pa.
1956 Blue Hill Country Club Boston, Mass. 1955 Meadowbrook Country Club Detroit, Mich.
1954 Keller Golf Club St. Paul, Minn.
1953 Birmingham Country Club Birmingham, Mich.
1952 Big Spring Country Club Louisville, Ky.
1951 Oakmont Country Club Oakmont, Pa.
1948 Norwood Hills Country Club St. Louis, Mo. 1947 Plum Hollow Country Club Detroit, Mich.
1946 Portland Golf Club Portland, Ore.
1944 Manito Golf and Country Club Spokane, Wash.
1942 Seaview Country Club Atlantic City, N.J.
1941 Cherry Hills Country Club Denver, Colo.
1940 Hershey Country Club Hershey, Pa.
1939 Pomonok Country Club Flushing, N.Y.
1938 Shawnee Country Club Shawnee-on-Delaware, Pa.
1937 Pittsburgh FC Aspinwall, Pa.
1936 Pinehurst Country Club Pinehurst, N.C.
1935 Twin Hills Country Club Oklahoma City, Okla.
1934 Park Country Club Williamsville, N.Y.
1933 Blue Mound Country Club Milwaukee, Wis.
1932 Keller Golf Club St. Paul, Minn.
1931 Wannamoisett Country Club Rumford, R.I.
1930 Fresh Meadows Country Club Flushing, N.Y.
1929 Hillcrest Country Club Los Angeles, Calif.
1928 Five Farms Country Club Baltimore, Md. 1926 Salisbury Golf Links Westbury, N.Y.
1925 Olympia Fields Country Club Olympia Fields, Ill.
1924 French Lick Springs French Lick, Ind. 1923 Pelham Country Club Pelham Manor, N.Y.
1922 Oakmont Country Club Oakmont, Pa.
1921 Inwood Country Club Far Rockaway, N.Y.
1920 Flossmoor Country Club Flossmoor, Ill.
1919 Engineers Country Club Roslyn, N.Y.
1916 Siwanoy Country Club Bronxville, N.Y.